The grant supports the Philippine Government’s goal of improving connectivity across the country and moving towards a digital economy. The Department of Information and Communications Technology (DICT) has boosted its bid to improve the country’s connectivity after receiving a grant recently. 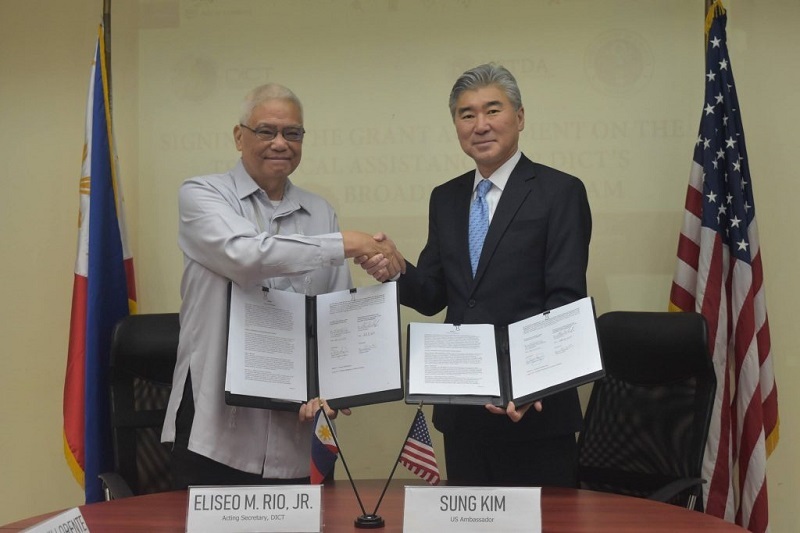 According to a recent press release, DICT Acting Secretary Eliseo M. Rio Jr. received the award of grant from the United States Trade and Development Agency (USTDA), through US Ambassador to the Philippines Sung Kim, for the implementation support for the National Broadband Program (NBP). It was given on Thursday, 7 February 2019 and will fund technical assistance for DICT in refining technical and operational designs, assessing future market demand, and preparing documentation required for the financing and implementation of the NBP. The advisors who will assist the Department in accomplishing these tasks will be chosen by the Department from qualified American firms. The Acting Secretary explained in a report that the funding assistance was a tied grant. This is a scheme where the Department will have to hire a US consultant to help with the design of the network and assess the equipment and various requirements in putting up the NBP. He furthered that this is over and above the budget of the NBP for 2019, which he said was proposed at US$ 38.3 million (PHP 2 billion). DICT Undersecretary for Development and Innovations Denis Villorente said the consultant to be hired would be sought for expertise on making key decisions for the design and use of the proposed NBP. The NBP is the government’s blueprint in accelerating the deployment of fibre optics, fibre optic cables and wireless technologies. The aim of which is to improve the overall internet speed and service availability and affordability across the country, particularly in remote areas. Ambassador Kim explained that the grant supports the Philippine Government’s goal of improving connectivity across the country and moving towards a digital economy. The U.S. is a strong ally of the Philippines and is proud that the partnership expanded into technology and communications. Amounting to US$ 456,300 (PHP 23.8 million), the grant will not only be supporting the NBP, as reported, but will also be used to provide access to the underserved markets throughout the country. Moreover, the grant demonstrates USTDA’s commitment to supporting the development of quality information and communications infrastructure and broadband capabilities in the Philippines. Not only that, but this project will expand opportunities for U.S. companies to deliver innovative technologies and solutions in the Philippine market. OpenGov Asia has earlier reported on a Tripartite Agreement to boost the Philippines’ National Broadband Plan. The report detailed how the Memorandum of Agreement (MoA) signed by DICT, the National Grid Corporation of the Philippines (NGCP) and the National Transmission Corporation (TransCo) will allow the utilisation of a 6,154-kilometre spare optical fibre for the implementation of the NBP.